Step 1: Just Login to your blogger account. After signing-in you will redirected to your Blogspot / Blogger.com Dashboard. Step 2: Now, you will see a tab ‘New Post’ below title of your Blogspot / Blogger.com blog. Click it to create a new post. Step 3: You can create a new post in just two modes. First in ‘Edit HTML’ and second in ‘Compose’ mode. 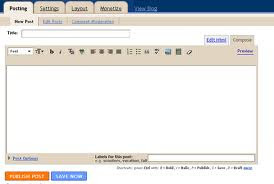 If you are well aware of HTML language the create your post in ‘Edit HTML’ mode otherwise create in ‘Compose’ mode. Step 4: Write the title of your newly post in title bar. Then in body section write down your complete post. Step 5:You can now click on the publish Tab. And that’s it. Please Hit the Like button if it was helpful.